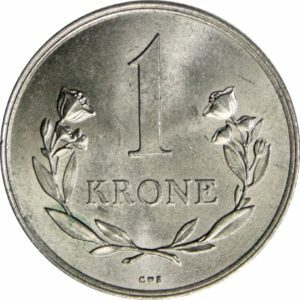 Greenland, 5 kroner dated 1944, mainly struck for use by American forces in Greenland during World War II, when 5 Kroner was equal to one U.S. dollar. Philadelphia Mint. Grading: VF. Reference: KM 9. 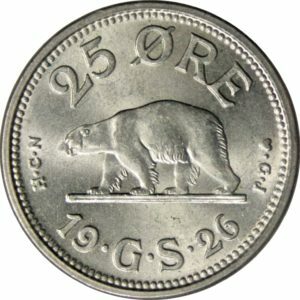 Weight: 13,54 g.
Greenland, 25 øre dated 1926, struck for the Danish Administration of Greenland. Grading: VF. Reference: KM 5. 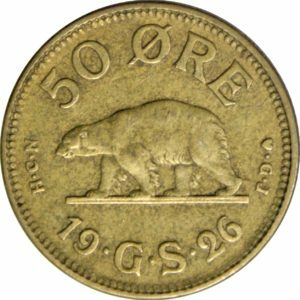 Weight: 7,1 g.
Greenland, 50 øre dated 1926, struck for the Danish Administration of Greenland. Grading: VF. Reference: KM 7. 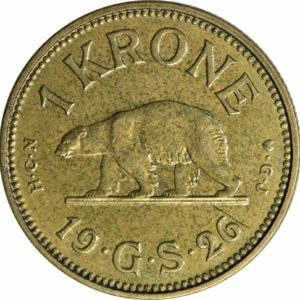 Weight: 3,77 g.
Greenland, 1 krone dated 1926, struck for the Danish Administration of Greenland. Grading: VF. Reference: KM 8. 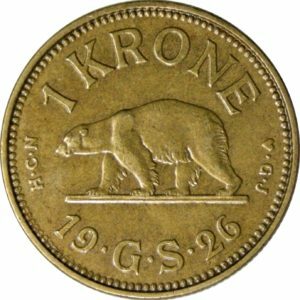 Weight: 7,54 g.
Greenland, 1 krone dated 1926, struck for the Danish Administration of Greenland. Grading: XF. Reference: KM 8. 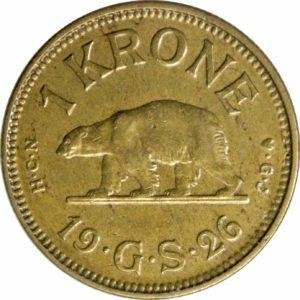 Weight: 7,31 g.
Greenland, 1 krone dated 1926, struck for the Danish Administration of Greenland. Grading: XF. Reference: KM 8. 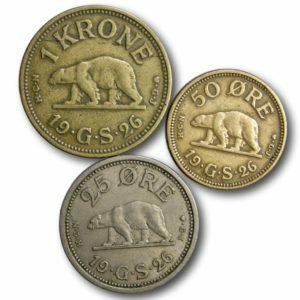 Weight: 7,3 g.
Greenland, coin set with 25 øre, 50 øre and 1 krone dated 1926, struck for the Danish Administration of Greenland. Illustration picture – the coins will be graded Fine or better. Reference: KM 5, 7 and 8. 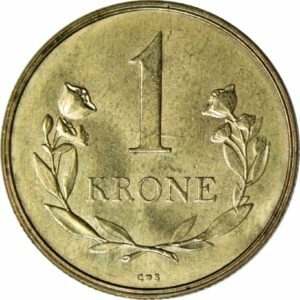 Greenland, 5 kroner dated 1944, mainly struck for use by American forces in Greenland during World War II, when 5 Kroner was equal to one U.S. dollar. Philadelphia Mint. Grading: XF. Reference: KM 9. Weight: 13,58 g.
Greenland, 25 øre dated 1926, struck for the Danish Administration of Greenland. Grading: XF / Mint State. Reference: KM 5. 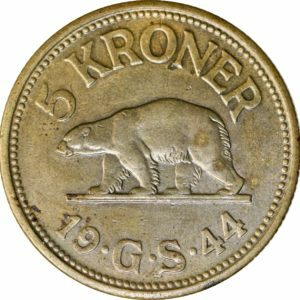 Weight: 6,91 g.
Greenland, 1 krone dated 1926, struck for the Danish Administration of Greenland. Grading: VF. Reference: KM 8. Weight: 7,26 g.
Greenland, 1 krone dated 1957, struck for the Danish Administration of Greenland. Grading: XF / Mint State. Reference: KM 10. 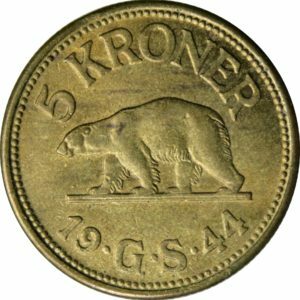 Weight: 7,39 g.
Greenland, 1 krone dated 1964, struck for the Danish Administration of Greenland. Grading: XF / Mint State. Reference: KM 10a. Weight: 7,4 g.